OFFice2PDF is a new feature of PDF-XChange Version 6 Standard and PRO, which allows batch converting of all the supported Microsoft Office document formats for MS Word, Excel and the HTML document and image format types - to the PDF format. Please note - the PDF-XChange printer is required for OFFice2PDF to function and uses this virtual print driver to perform the 'core' PDF conversion - OFFice2PDF simply provides a convenient and efficient application front end to the functionality of PDF-XChange for batch conversion of suitable file format types to the PDF format. It should also be noted that the file type you wish to convert can only be processed if the 'host' application is installed and configured on your system - for example if you wish to convert an MS Word .doc file - both PDF-XChange and OFFice2PDF require MS Word to be installed on your system to open and process that file via the 'print' engine of PDF-XChange to a PDF format file. Documents, for conversion may be added from the OFFice2PDF Main Window by using a very simple set of commands or simply by dragging documents onto that window from Windows Explorer. Moreover, the user is able to set "Watched Directories", - documents in any of the supported formats will be automatically converted to PDF files if saved/moved to the watched folder location - without further action by the user - provided OFFice2PDF is running. 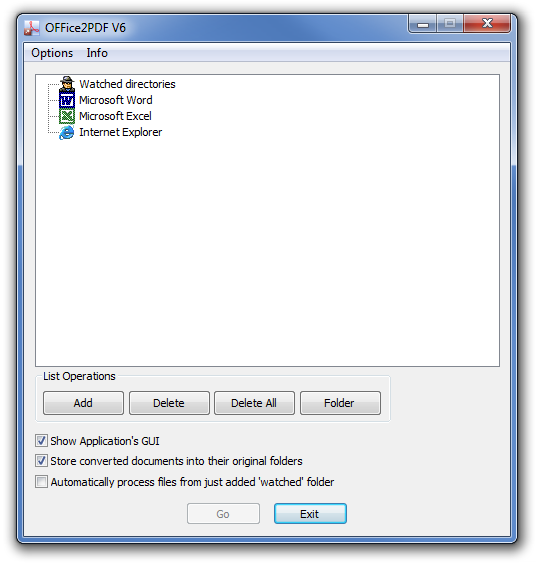 PDF files created with the OFFice2PDF application may be saved in the same 'Watched' folder or in a folder specified by the user for the resulting conversion files.